When I first saw Djeco’s new box of wooden macaron’s ($22), I wanted to throw a pretend party with my little guy and his friends immediately. Macarons are hot in the event and food industries and would make such a fun addition to a make-believe party. Plus they are just so charming. Here is a round-up of some very adorable and fun play desserts for the little ones. I fell in love with these new wooden Macarons ($22) by French company Djeco when I first spied them at Pacifier, a local boutique store here in Minneapolis. 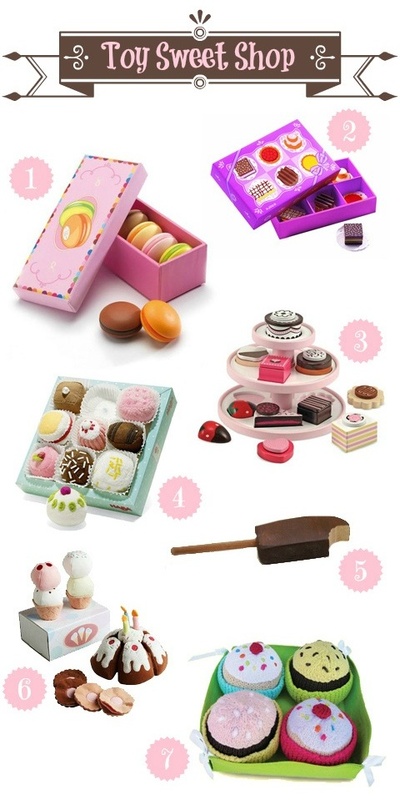 The package comes with six very sweet modern wooden macarons packaged in a cute box. This pastry set ($15) by Djeco, is a perfect addition to any modern tea party. Haba’s 9-piece box of soft Petit Fours ($14) is a sweet little treat for your son or daughter. While Melissa & Doug has many options when it comes to wooden desserts for children, this Sweet Treat Tower ($20.60) takes the cake. The accompanying cake stand is simple, but perfect for your little aspiring host or hostess to practice dessert displaying. While Summer is behind us, I can’t help but call out summer treats. Yum! Etsy shop Arts of the Heart sells this chocolate ice cream bar ($3) as well as a few other fun frozen treats. This very budget friendly dessert set by Ikea includes ice cream, cake with candles and cookies for just under $8. While most other play food is for children 3 and up, this sweet set of four Fair Trade cupcakes ($29.95) in a fabric serving tray is for children 6 months and up and includes cupcake liners that peel down just like the real thing. It is so ironic to see this post today! My 2.5 year old fetched a spatual today and told me he was “cooking steak” life his Daddy! We need some play food at our house for sure! These are adorable! I don’t know which one I would buy. For my little one for christmas !? You can also click on the macaron link and it will take you here. Good luck. They are so cute!